The API Food Poison Detection Kit comes with a set of three separate detectors and everything needed to analyze a food sample and record the results for future use or as evidence. The Kit was developed under contract with the U.S. Department of Defense through TSWG and is used in countries throughout the world. The Kit has been validated by the U.S. Department of Defense and several other agencies. In 2010, the Kit was validated by the Food Science Department of North Carolina State University which in conclusion found that the Kits “readily detect dangerous levels of poison yet they respond very rapidly and are easy to use even by a layman“. 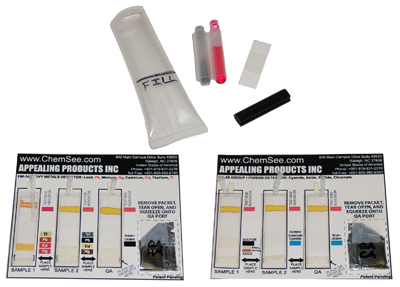 ChemSee distributes the API Food Poison Detection Kit for detecting dangerous levels of more than thirty poisons. The detected poisons include compounds containing cyanides, azides, chromates and sulfides (Group I Poisons), thallium, lead, cadmium and mercury (Group II Poisons) and ALL arsenic-containing compounds (Group III Poisons). 1 to 7 grams of sample are required, depending on the food tested. Detector for All Arsenic-Containing Compounds, all materials for sample preparation. This Kit includes full color instructions. Detector for Cyanide, Azide, Sulfide and Chromate, all materials for sample preparation and built-in Quality Assurance. This Kit includes full color instructions.